CD, harp solo (2018); total time 54:14; CD in DigiPack with 12 page booklet. Special Edition: 12" Vinyl LP (45 rpm, maximum quality, total time 32:10), incl. 4 page folding booklet with panoramic photo. Limited edition, serialised and signed. "Finistère is the westernmost part of Brittany, where continent and Atlantic ocean meet, which has carved the region into a partly harsh, partly gentle landscape. As unique as the region are the people and the music—of all "Celtic" music styles, Breton music was always the one that inspired me the most, in a hard to describe, direct fashion and beyond all language barriers." 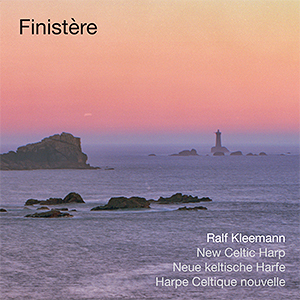 "While traditional Breton music had been a major inspiration, Ralf goes for a Pan-Celtic sound. His execution is muscular and confident while being emotional and melodic at the same time." Free shipping throughout Germany, add 4.- EUR for shipping outside Germany. Vinyl LP: 29.- EUR (LP only), 39.- EUR (bundle with Finistère CD), free shipping within Germany. 39,- EUR (Vinyl LP only), 49,- EUR (Vinyl LP + CD) with international shipping. Order will be confirmed before purchase is committed. Payment via IBAN transfer or PayPal invoice. Please state item number and, if ordering multiple items, the album names. Habitez-vous la France ? Vous pouvez commander cet album dans la boutique de la Maison de la Harpe ! 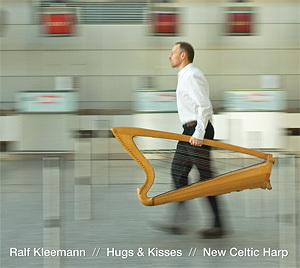 With "Hugs & Kisses", Ralf Kleemann presents his third album with music for the Celtic harp. Most of the tracks, which are generously enriched with solo parts, were composed during various journeys and concert tours throughout Europe. On this album there are musette waltzes, an Irish love song, a tango-mélange, as well as a Scottish presto allegro, originally a pipe tune. The title track, "Hugs & Kisses," is a little suite in four parts. Free shipping throughout Germany, 4.- EUR shipping outside Germany. "Tides" is Ralf Kleemann's second solo album, entirely comprised of his own compositions. 12 pieces, new and of their own kind, display the full character of the Celtic harp. 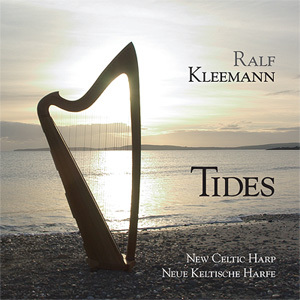 "Tides" was inspired by the Irish Atlantic coast, in whose vicinity Ralf Kleemann lived for five years. 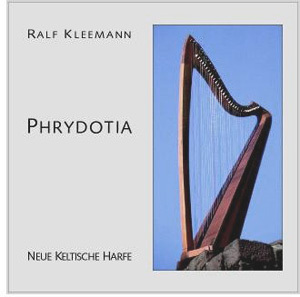 With "Phrydotia", Ralf Kleemann presented his debut album with some of his own compositions, improvisations and arrangements of traditional music.